Yay!! She's here! So, I opened the box, unpacked everything, oohed and aahed a bit, and um, now what??!!! 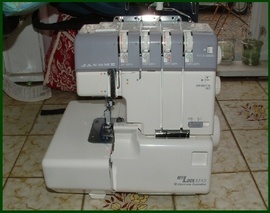 The Complete Serger Handbook (which I'm reading as fast as I can so I can figure out what the heck to do with the thing! 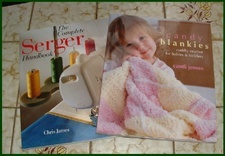 ), and Candy Blankies, full of crocheted baby blankets. The dark fabric (which you can't really see) is a grey checked fleecy sort of thing (pants for the babes); then some Munki Munki mermaid fabric (someone stop me from buying any more Munki Munki, please! 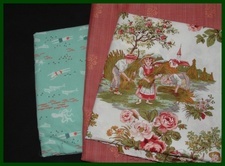 ); then a mauve-ish embroidered fabric (to be a skirt); and last, a toile-ish "farm" theme fabric.